Sahib and the Crew Save the World: Obama and Ginsburg: Founding Fathers? Hacks! 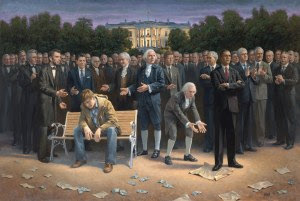 'The Forgotten Man' by Jon McNaughton . Buy the print HERE! I admit it. I have a colossal man-crush on the U.S. Constitution. To think that our Founders crafted a document that has withstood liberal progressive onslaught for over 220 years is simply awe-inspiring. To this American, the Constitution is our nation's most precious commodity, our greatest contribution to humanity. It is a shining beacon of freedom, giving hope to the oppressed all across the globe that like the Founders, they too have a chance to shed the manacles of tyranny. Unfortunately, not every American feels this way. 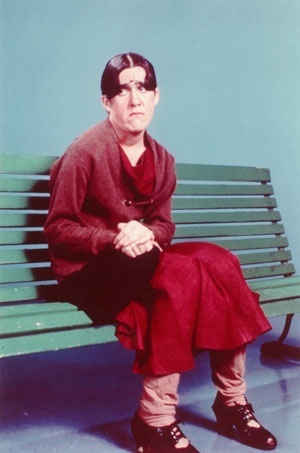 Even more unfortunately, two of those are President Barack Hussein Obama and Supreme Court Justice Ruth Buzzi Ginsburg. What's frustrated people is that I have not been able to FORCE (emphasis mine) Congress to implement every aspect of what I said in 2008. Well, you know, it turns out our Founders designed a system that makes it more difficult to bring about change than I would like sometimes. There is is folks, everything you need to know about Barack Hussein Obama, distilled down into 48 of his own despicable words. Freedom loving Americans should be very thankful that the Founders designed the system that they did. More than 200 years ago, they could foresee a tyrant want-to-be gaining the highest office in the land, and they knew what to do about that possibility. Just more evidence of the true agenda of Barack Hussein Obama, and of the brilliant foresight of the men in that Philadelphia room during the summer of 1787. I would not look to the U.S. Constitution if I were drafting a constitution in the year 2012. I might look at the constitution of South Africa. That was a deliberate attempt to have a fundamental instrument of government that embraced basic human rights, had an independent judiciary, it really is, I think, a great piece of work that was done. Please join us on Facebook, and click the Conservativeblogs.net badge at the right to voice your opinion of SACSTW! Crew, RIGHT ON, this is a great post. Sums it up and I like the "crush" part, the Constitution is everything, once they trivialize it and shred its importance its over. Laurel- Thanks for the kind words. At least the secular progressives like Barry and Ruthie are finally coming out into the open with their contempt for the Constitution. Can you imagine the damage another 4 years of Dear Leader would inflict on our country?